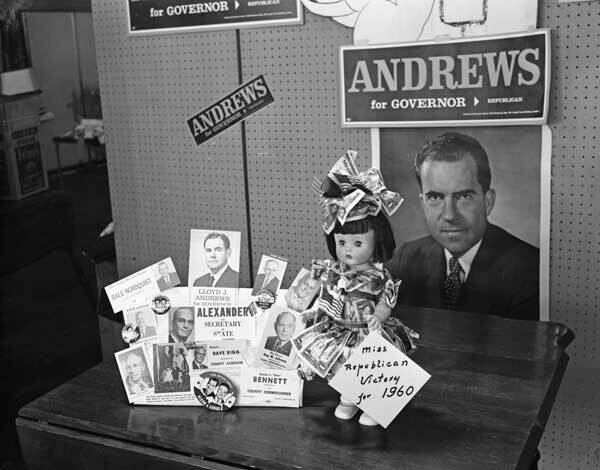 Republican Campaign Memorabilia, 1960, by Merle Junk, Susan Parish Photograph Collection. Here’s the link to this photo. The Washington State Archives maintains hundreds of documents and artifacts related to campaigns for elected positions, along with the products of those elected officials. For example, there are several online audio files, meeting minutes, ordinances, and resolutions showing our legislators in action. Additionally, the State Archives has a collection of campaign posters, pins, placards, and other paraphernalia. A quick way to find several of these online records is to enter “political campaigns” in the Search by Keyword section above, or contact our State Archives research team at research@sos.wa.gov. 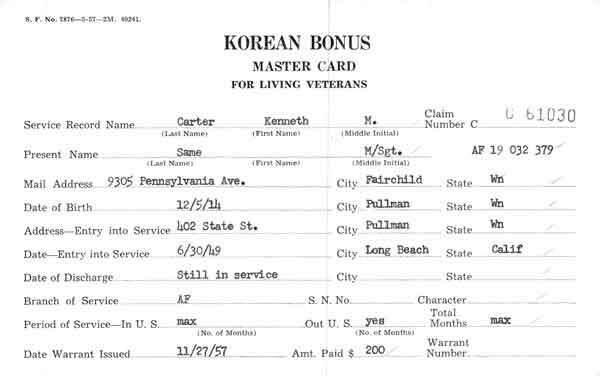 Korean War Era Veterans’ Bonus Claims Card, 1955-1960, Department of Veterans’ Affairs. To view this document, click here. The Washington State Archives offers a wide array of military records including: muster rolls, casualty lists, service records, enlistment registers, bonus claims, and much much more. The records date back to the Territorial days through the Vietnam War. Many of the records have images available, however, even the non-image records provide fascinating details. Take a peek at our State’s military history at Military Records. For more information, contact the State Archives research team at research@sos.wa.gov. Washington State’s House of Representatives photo from the House of Representatives Group Photos 1883-1981 Collection, Jeffers Studios. Click here to view this record, and here to hear an audio file of the House of Representatives from 1979, Education Committee. 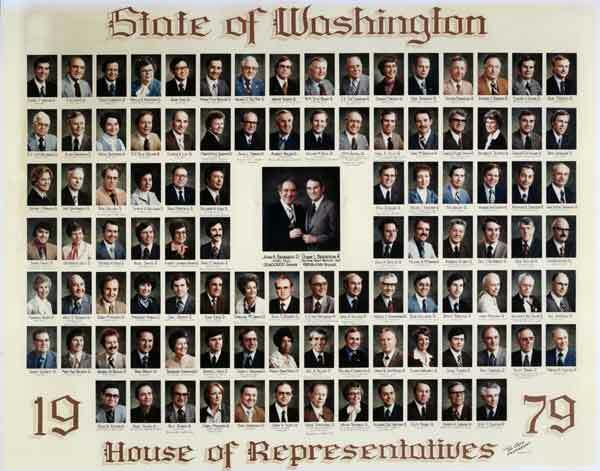 Three series of audio files are online at the Washington State Digital Archives: 1) House of Representatives Committee Meeting Recordings, 1973-2002; 2) Floor Recordings from the Office of Secretary of Senate, 1971-2010; and 3) Spokane Voices of the Pioneers Oral Histories. Legislative audio files include a broad range of topics: social, health, family, housing, utilities, energy, environment, agriculture, commerce, finance, labor, education, elections, and so much more. The oral history accounts cover topics such as homesteading and wheat farming, schools and hospitals, entertainment and social clubs, railroads and bridges, and stories of Spokane’s pioneers to mention a few. Enjoy these recordings from the Digital Archives: Audio Records. Vancouver School District No. 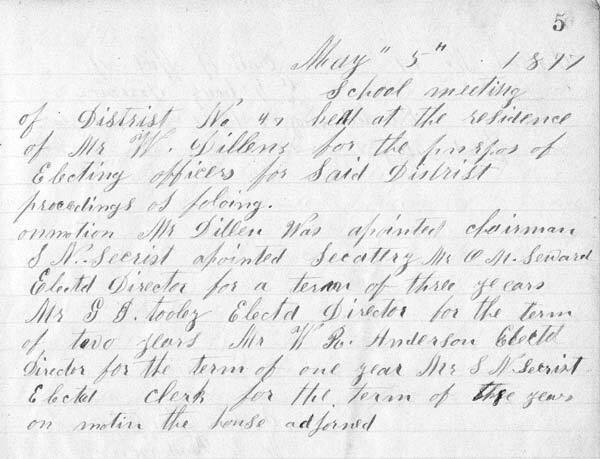 47 Minutes, May 5, 1877, Vancouver Public Schools, School Board Minutes, 1877-1999, Washington State Archives Southwest Region Branch. This document can be viewed online here. The cities we live in, the fire districts that protect us, the school districts that educate us, the health districts who heal us when we’re sick. They all have something in common: Minutes, Ordinances, and Resolutions passed by their governing bodies. Washington State Archives has awarded over $3.1 million to 266 local government agencies over the past ten years to preserve these types of public records and share them with our constituents, the public. This year, our staff scanned, indexed, and uploaded Minutes, Ordinances, and Resolutions from 37 different local government entities to our Digital Archives website. We added over 300,000 new pages—from as early as 1877, to as recent as 2010—to these collections. Take some time and see if your local government has records on our website, and while you’re searching, see if your name shows up in our collections. Washington State Archives has over 28 million searchable records online. State Library Photograph Collection, 1851-1990, Washington State Archives, Olympia, WA. Boeing has been an important part of the Washington State economy since its founding in Seattle in 1916. The Boeing Clipper pictured here debuted in 1941. 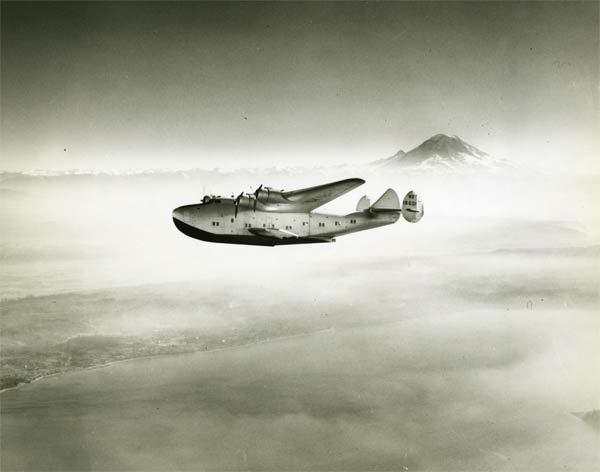 The Washington State Digital Archives has a considerable collection of images related to Boeing in the State Library Photograph Collection. Explore the State Library Photograph Collection. Here is a link to the record seen above. 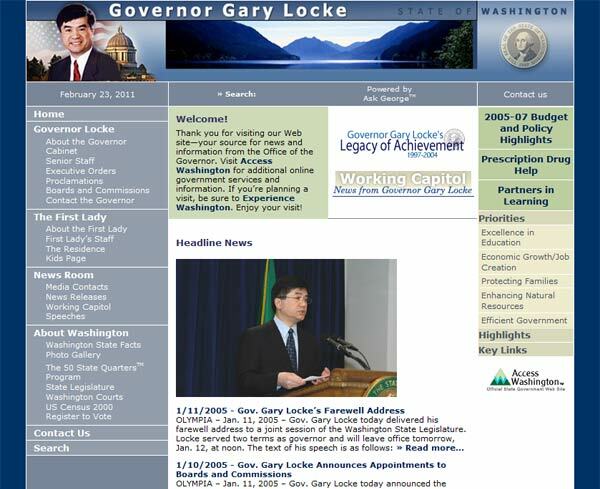 Office of the Governor, Website of Governor Gary Locke, 2004, Washington State Archives. The Washington State Archives is responsible for the preservation of archival electronic records from the many state and local government agencies in Washington. Examples of these records are the official websites of Governor Gary Locke (1997-2005) and Governor Mike Lowry (1993-1997). Governor Locke’s website is an important historic document and includes 1,235 web pages and more than 3,200 files from the Locke Administration. Among the files are 1,605 press releases, 536 speeches, and 162 media events. Explore the Website of Governor Gary Locke. Explore the Website of Governor Mike Lowry. Read a press release about the preservation of Governor Locke’s website. This collection contains the names of over 500 inmates housed in the Territorial Penitentiary – Seatco, near what is now the town of Bucoda. The privately-run prison operated from 1877 until 1888 when the new Penitentiary was opened in Walla Walla. 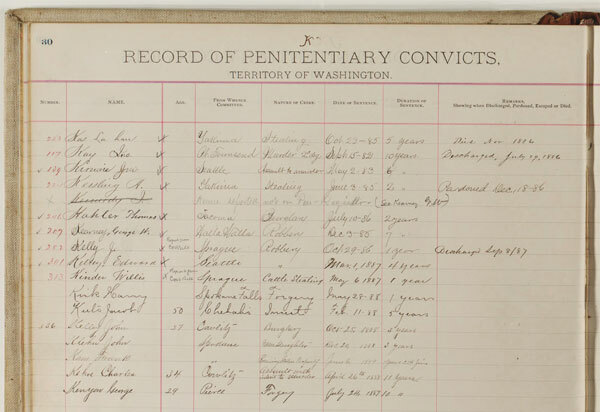 The register shows name, alias, residence, place convicted, crime, sentence, physical condition, and date of discharge, parole or escape and is a fascinating glimpse into the social history of Washington at a key moment in our history. Explore the Corrections Department, Penitentiary, Convict Record series. Here is a link to the record seen above.